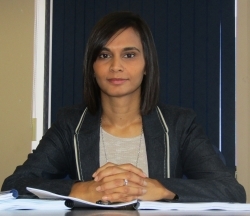 Ithala SOC Limited has appointed one of South Africa's leading anti-money laundering specialists Michelle Sewchuran as its Compliance Officer, a senior management position reporting directly to Ithala's Chief Executive. Sewchuran, who took up her position on 14 May 2018 will oversee the development and implementation of Ithala's enterprise governance framework; integrated compliance management strategy; ensure the overall management of all types of business risks and ensure statutory and regulatory compliance. Other key tasks which she is well cut out for will be to ensure the formulation and implementation of a Compliance Risk Management Framework and the development and implementation of a compliance policy, standards and programme throughout the organization. For the past 10 years Sewchuran has applied her skills at the Financial Intelligence Centre (FIC) where she was Manager Anti-Money Laundering. The FIC is South Africa's national centre for the receipt of financial data, analysis and dissemination of financial intelligence to the competent authorities. It was established by the Financial Intelligence Centre Act, 2001 (Act 38 of 2001) and has the mandate to identify the proceeds of crime, combat money laundering and terror financing. She obtained a Masters in Commercial Law degree in 2007 from the University of KwaZulu-Natal and a post graduate diploma in Compliance Management (2009) from UNISA. Her career journey started with an LLB obtained in 1999 from the University of Natal (now UKZN) after which she did her practical legal training for attorneys at UKZN. She joined the Financial Services Board as a senior analyst in May 2001. After four years she left for the Financial Intelligence Centre where she was senior compliance officer from 2004 to 2009 when she became Manager: Guidance and Prevention. Six years later she was promoted to Manager: Anti-Money Laundering Compliance Monitoring. Ongoing learning is important to Sewchuran who has done 13 short courses in the space of seven years including, management and leadership, risk management, business continuity, how to manage your business and compliance monitoring. She is a member of the Association of Certified Anti-Money Laundering Specialists. Born and bred in Durban, Sewchuran is an old-girl of the Apollo Secondary School, Umhlatuzana, Chatsworth and she is glad to be home to play a crucial role in Ithala Soc Limited's progress towards obtaining a banking licence. For more information visit www.myithala.co.za, call 031 366 2500 or follow #MoveToIthala.